Whether they thought private property was a sine qua non of a free society or organised theft, classical economists, from Adam Smith (1776) to Karl Marx (1891), accorded a central position to the role of property rights or the “relations of production” in the process of economic development. However, it is only recently that mainstream modern economics has come around to this point of view. The cheerful view of economists about the efficiency of competitive markets assumes that property rights are well-defined and well-enforced. Given this presumption, it is no wonder that, for a long time, economists focused on savings and capital accumulation as the key to economic development. But in a world where property titles are ill-defined, where legal disputes take decades to settle, where poor farmers or small business owners face eviction threats, it is difficult to imagine how they can take a long-run view – saving, investing, and climbing their way out of poverty. Security of property rights therefore is of utmost importance. The term property right refers to an owner's right to use a good or asset for consumption and/or income generation (referred to as "use rights"). It can also include the right to transfer it to another party, in the form of a sale, gift or bequest ("transfer rights"). A property right also typically conveys the right to contract with other parties by renting, pledging, or mortgaging a good or asset, or by allowing other parties to use it, for example, in an employment relationship. By property rights, economists typically refer to private property rights, a key feature of which is being able legally to exclude others from using a good or asset. This affects resource allocation by shaping the way that individuals choose to carry out productive activities involving the use of the good or asset, undertake investments that maintain or enhance its value, and also, to trade or lease the asset for other uses. A recent influential advocate of the importance of the link between property rights and economic efficiency is the Peruvian economist Hernando de Soto. According to him, what the poor lack is easy access to the property mechanisms that could legally fix the economic potential of their assets so that they could be used to produce, secure, or guarantee greater value in the market. Therefore, even when they have some assets, they are “dead” capital. Economists have emphasised four main aspects of how property rights affect economic activity. The first is expropriation risk – insecure property rights imply that individuals may fail to realise the fruits of their investment and efforts. Second, insecure property rights lead to costs that individuals have to incur to defend their property, which, from the economic point of view, is unproductive. The third is failure to facilitate gains from trade – a productive economy requires that assets be used by those who can do so most productively, and improvements in property rights facilitate this. In other words, they enable an asset's mobility as a factor of production (e.g., via a rental market). The fourth is the use of property in supporting other transactions. Modern market economies rely on collateral to support a variety of financial market transactions, and improving property rights may increase productivity by enhancing such possibilities. It is possible to take a bird's eye view of the quality of property rights using cross-country data. To illustrate, we take two measures of property rights regimes using standard sources. The first is a measure of the security of property rights from the International Country Risk Guide. It is measured on a scale between 0 and 10. A higher score corresponds to better protection of property rights. Figure 1 shows that this score is positively correlated with income per capita. 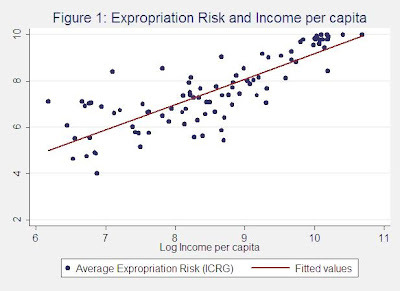 In other words, countries with a higher risk of expropriation have lower levels of income per capita. The second measure comes from the World Bank’s Doing Business proect. We focus on a measure of the ease with which individuals can register their property, specifically the country's rank on this measure for 172 countries. This is a purely administrative dimension to property rights and follows the logic of the de Soto argument. Figure 2 shows that this too is strongly negatively correlated with income per capita in 2000. 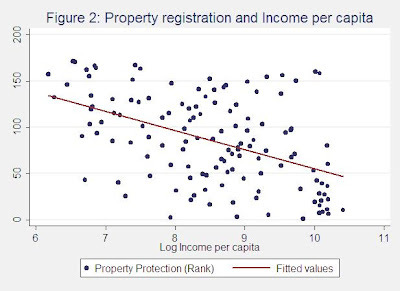 Thus, this more administrative dimension of property rights is weaker in low-income countries (these figures are from Besley and Ghatak 2009). Together these figures illustrate the central proposition that improving property rights is associated with economic development. However, they say nothing about the direction of causation. It is possible that economic development induces a switch to improved property rights, as opposed to property rights facilitating economic development. The economics literature now has a plethora of micro-economic studies that suggest that securing private property affects economic decisions in the way that the theory suggests. For example, improving squatters’ rights in Peru seems to have reduced the need to use guards according to Erica Field (2007). Her work on Peru with Maximo Torrero also suggests that property titles are associated with increase in approval rates on public sector loans by as much as 12% when titles are requested by lenders (Field and Torrero 2006). In a related study, Sebastian Galiani and Ernesto Schargrodsky (2005) have looked at the collateral effect of property rights reform. They look at a group of squatters who occupied an area of wasteland in the outskirts of Buenos Aires more than 20 years ago from the time of the study. An expropriation law was subsequently passed, ordering the transfer of the land from the original owners to the state in exchange for a monetary compensation, with the purpose of entitling it to the squatters. They find that it improved housing investment, among other things. But the creation of private property rights cannot be taken for granted. The emergence of effective private property rights has had to steer a course between the twin problems of anarchy and predation. In a state of anarchy, the main problem is dispersed coercive power, as now characterises warlord societies. The obvious answer is to create a monopoly protector as suggested, centuries ago, by Thomas Hobbes. But who is to protect the citizens against Leviathan? This is the problem of predation. All societies have had to grapple with this problem at one point in their history and many continue to do so. There are a number of ways of dealing with these issues, most notably by building political institutions that create effective checks and balances and establish the rule of law in a way that is binding on policy makers. But these require more than the stroke of a pen. A lot rests on the reputation of government that needs to recognise its long-run interest ahead of short-term gains from expropriating property. History is replete with examples where governments have expropriated their citizens. A case in point is modern day Zimbabwe, where Robert Mugabe seized the property of farmers to distribute to his political supporters. Policymakers who are aware of the problem of predation can seek innovative ways of creating secure property. One possibility is to tolerate some amount of secrecy and anonymity in private economic decisions vis-à-vis the government, which allow individuals to protect themselves against expropriation. Another is to use more decentralised policymaking and competition between governments, what is known as market preserving federalism. Both means have arguably been used to secure property rights in China to some degree. But not all state failure stems from the breakdown in law and order or from predatory states. Many governments have simply failed to invest sufficient in basic legal institutions and property registration institutions. The main priority is then to spend more in such areas to promote more secure property rights. But political economy issues are likely to be important here. To the extent that the economically powerful can benefit from insecure property rights, there may be limited political will for property rights reform. This is likely to prevail when the absence of formal property rights encourages the poor to seek refuge in networks where there is market power. The classic case is of a moneylender to whom the poor are beholden when property rights prevent their assets being used as collateral elsewhere. In all cases, it is clear that the solutions have to be, to some degree, country-specific. The mantra of property rights reform too easily degenerates into an empty slogan. Also, property rights improvement is not a panacea especially when other aspects of an economy perform badly. But identifying the appropriate institutionalised solution is only a first step. How the political process is able to prevent the potential losers from blocking the reform is likely to be the crucial element. Hobbes, Thomas (1660) The Leviathan. Smith, Adam (1776) An Inquiry into the Nature and Causes of the Wealth of Nations, W. Strahan and T. Cadell, London. The South Luangwa Conservation Society is a non-profit community based organisation, committed to the conservation of the local wildlife and natural resources of the National Park and surrounding Game Management Areas. Regional Economic Outlook - Sub Saharan Africa. The FSP reform report put together by experts assembled by MACO can be found here. Press Briefing of African Financial Ministers last saturday. Hon Musokotwane is around 22:40 minutes into the video. The DRC's Grand Inga hydroelectric project, which could dwarf China's Three Gorges Dam could be onstream by 2025. Still in the feasibility stages, the Grand Inga, expected to generate 40,000 megawatts, could be a long-term solution to all our power problems, but investors have held back due to political risk and its $80 billion price tag. For now, the DRC, Angola, Namibia, South Africa and Botswana are working on building Inga 3, expected to generate 4,300 MW and link up with the southern African grid, but Fall said it was not likely to come onstream before 2020. President Barack Obama’s first appearances outside North America – in London, Strasbourg, Prague, and Istanbul – galvanized world attention. But what that trip singularly failed to do was paper over a startling fact: the “Washington Consensus” about how the global economy should be run is now a thing of the past. The question now is what is likely to replace it. Although China is often said to lack “soft power”, many of its ideas on economics and governance are coming into ascendance. Indeed, in pursuit of national economic stability, the Obama administration is clearly moving towards the kind of government intervention that China has been promoting over the past two decades. In this model, the government, while continuing to benefit from the international market, retains power over the economy’s “commanding heights” through strict control over the financial sector, restrictive government procurement policies, guidance for research and development in the energy sector, and selective curbs on imports of goods and services. All these factors are not only part of China’s economic rescue package, but of Obama’s stimulus plan as well. China is clearly pleased to see that the United States is now also placing cool calculation of its national interests at the forefront of its foreign policy. “In delivering a better life for people on the ground, one should be more concerned with substance than with form,” Obama stated in an interview just before his inauguration. Rather than obsessing about elections, the US now seeks to build pragmatic alliances to buttress its economic needs. This requires, first of all, cozying up with China and the Gulf states – the main lenders to the US Treasury – as well working with Iran and Russia to limit the costs of the wars in Afghanistan and Iraq. As the US backtracks on its liberal standards, it is flirting with what can be called the “Beijing Consensus”, which makes economic development a country’s paramount goal and prescribes that states should actively steer growth in a way that suits national stability. What matters in this worldview is not the nature of any country’s political system, but the extent to which it improves its people’s wellbeing. At the diplomatic level, this implies that national interests, not universal norms, should drive co-operation. This diplomatic and economic realism is more than a reversal of the neo-conservative muscle-flexing of the George W Bush years. It is an attempt by a declining power to use its restrained capabilities in a more economical way. America’s new pragmatism is also the consequence of a process of “reverse socialisation”. Over the past two decades, the US and its European allies believed that they could inculcate the rest of the world with their economic and political principles. Countries like China became enmeshed in a web of multilateral organisations and subjugated to conditional engagement strategies. Nowadays, the West does not have the leverage to enforce these conditions. Moreover, the majority of developing countries now actively embrace multilateral bodies as part of their development strategies. As we move from a unipolar international order to one with multiple regional powers, realism should allow them to vie for influence while keeping the costs as low as possible. The result will be a new concert of powers, tied together by their fixation with national economic growth and the objective of discouraging others from causing instability that risks intervention. Instead of entrusting America with the arduous task of safeguarding international stability on its own, the BRICs (Brazil, Russia, India, and China) will assume a more prominent role in policing their own backyards. Russia can have its Caucasus, and if the generals in Myanmar should go mad, it would become China’s and India’s problem to sort out. America’s policy shift will inevitably erode the Western liberal axis. America has the flexibility, capacity, and leadership to adapt to the new rules for pursuing diplomacy, but Europe simply does not. Its strategic relevance, even in the transatlantic partnership, is destined to weaken further. Realism will give the US more manoeuvreability in the short term, but it will have to sacrifice some of its soft power to achieve this. Whether America is able to strengthen its global influence in the future will depend not so much on its moral esteem, but on the extent to which it succeeds in revamping its economy and forging new alliances. The same will apply for other powers. But this rising Beijing Consensus offers no guarantee of stability. A concert of powers is only as strong as its weakest pillar, and requires a great deal of self-discipline and restraint. It remains to be seen how the American public will respond to its national U-turn. If one main player slides back into economic turmoil, nationalism will reduce the scope for pragmatic bargaining. Overlapping spheres of influence and frozen conflicts could again cause major conflict. And, if China comes out of the crisis as the big winner and continues to boost its power, zero-sum thinking will soon replace win-win co-operation. Government has, among other resources, so far released K440.8 Billion for capital expenditure towards infrastructure development and rehabilitation programmes approved by Parliament as part of the 2009 budget. The release of K440.8 Billion represents 24.7% percent release out of the K1. 781 Trillion Total capital expenditure budget planned for 2009. Among the institutions which have received significant resources is the Ministry of Works and Supply which has received K165.2 Billion as proceeds from fuel levy for use towards road maintenance activities by the Road Development Agency. K6 Billion has also been released for construction of new office blocks in Lusaka and Chongwe and an additional K6 Billion for boarder facilities at Katima-Mulilo Bridge of which K2 Billion is for construction of houses and K4 Billion for other boarder infrastructure. K7.6 Billion has been released for the Chirundu Boarder Infrastructure towards completion of works related to the flight terminal, the passenger control building, the sewerage disposal system, installation of street lighting and construction of the drug enforcement dog kernels all of which are being executed in line with the FNDP goal of having well developed and properly maintained quality infrastructure for sustainable national development by 2030. The Ministry of Works and Supply has also received K10 Billion for construction of housing units for the Zambia Army, Zambia National Service in Makeni and the Zambia Air Force at Twin Palm in Lusaka while the Central Statistical Office has received K2 Billion to speed up completion of the office block along Nationalist road in Lusaka. Out of the capital expenditure releases for the period under review, K29.3 Billion is for construction and procurement of housing units and, construction of a forensic laboratory and hospital infrastructure under the Ministry of Home Affairs. Among other resources released to the same Ministry is K2.3 Billion for prisons infrastructure development at Mwembeshi, Livingstone, Luwingu, and Kalabo. In addition, K2.7 Billion has been released for construction of immigration headquarters offices and boarder control posts at Kamapanda, Kilwa Island, Kambimbi, Namafulo, Sindamisale, Kanyala and Imusho. K2 Billion has been released for the rural electrification fund under the Ministry of Energy and Water Development of which K300 Million is for the Nansanga Farm Block and K1.7 Billion for the Kasaba Bay Electrification Project, while among other resources, the Ministry of Local Government and Housing has received K2.9 Billion for water supply and sanitation and K1.78 Billion for construction of low cost houses. In line with the long term goal of life-long education and training accessible to all by 2030, the Ministry of Education has received, among other resources, K18 Billion for construction of High Schools, K23.4 Billion for construction of Basic Schools, K4 Billion for infrastructure development at the Mulungushi University, K2 Billion infrastructure development at the University of Zambia and K1 Billion for infrastructure development at the Copperbelt University whereas among other resources, the Ministry of Science Technology and Vocational Training has received K1.75 Billion for rehabilitation of the Choma Trades Training Institute and K1.5 Billion for construction of Ukwimi Trades Training Institute. Among other resources, the Ministry of Agriculture and Cooperatives has received, K1.6 Billion for the Bangweulu Research Station, K1 Billion for rehabilitation of camp and block houses, among other things, in Mpongwe District. The release of 24.7% of infrastructure funds for 2009 is clearly consistent with our fiscal policy focus for 2009 which is geared towards increasing expenditure on infrastructure and social services. It is also in line with the Government’s objectives of encouraging diversification and enhancing competitiveness. The Ministry of Finance and National Planning urges members of the public to take greater interest in Government financed public works and projects being implemented in their localities to ensure that tax-payers resources are applied for intended purposes. In this way, we will then be participating in the development of the country and ensuring that optimum socio-economic benefits of these public works and projects accrue to the people of Zambia and the communities in which the infrastructure rehabilitation and development programmes are being implemented. Kaela Mulenga (Zambian Economist guest blogger) has weighed in on the Dambisa Moyo's Dead Aid thesis over at UK Zambians. Judging from the comments section, it appears the anti-aid brigade have the knives out. Its unfortunate when people are not willing to debate substance and respond to thoughtful pieces with ad hominem attacks. I am glad that on this blog we continue to uphold a culture of respect and when we disagree it is focused on ideas - that is how dialogue should be. We can do better than our politicians! We previously reviewed the book on this blog - see Dead Aid, By Dambisa Moyo ( A Review). Investment in tourism is quickly taking the lead with planned investment in the sector valued at U$72,820,000 representing 65% of the total planned investment in April, 2009. The Licence Permits and Certificates (LPC) Approval Committee of the ZDA approved 25 applications with planned investment valued at U$110,397,169 from various sectors at a meeting held yesterday. Planned investment in the manufacturing sector was at 15% valued at U$16,910,000 while investment in agriculture was in the third place with U$7,631,169. The other sectors were agriculture, real estate, service, education, health, construction and transport. 1,721 jobs opportunities are expected to be created from the investment. The increase in investment in the tourism sector is due to the promotion of the diversification programme by government and the attractive incentive package in the sector. Others in the sector are planning for the World Cup in 2011 and are anticipating an overspill from the games and an increase in the occupancy level. The LPC Committee at the same meeting considered applications for certificates from Micro and Small Enterprises and approved 27 applications in the service, trading and manufacturing sector that represents realised investment of K1, 409.587,950 and proposed investment of K1, 474,912.395. These MSEs currently employ 143 workers and expect to create an additional 118 new job opportunities. ZDA MSE Director, Windu Matoka says, “The sector is being recognized as the engine for growth like the Asian Tigers in the far east where they developed because of MSEs.” He notes that it is a requirement for enterprises to formalize their status with PACRO and register with the ZDA to access funds from Citizens Economic Empowerment Commission. The MSE sector contributes to the national treasury in form of taxes, levies and other fees and is increasingly being recognized as a critical sector by banks who are designing special products for them. Knowledge Empowers are working with orphans in Zambia. Legacy Missions are doing some fantastic work in Zambia. Zambia's plans to raise equity stakes in its copper mines could scare away foreign investors already unnerved by the global downturn, and hurt plans to boost the metal's output in Africa's largest copper producer. The plan was a surprise to copper firms and investors at a time when countries reliant on mining were trying hard to give incentives to attract investment following the collapse of commodity prices hit by the global financial crisis. Obiageli Ezekwesili, the World Bank vice president for Africa, said the plan would backfire by jeopardising Zambia's wider market reforms, hailed by the West as a model for Africa. "The populist reaction is to say let's take a stake, but do you want to risk capital in a sector where the private sector can take the risks?" she told Reuters. "This is an industry better left to the private sector to run." Zambia has been among the African countries hit hardest by the global crisis because of its dependence on copper, which contributes more than 60 percent of export revenues. The mineral-rich southern African country says it wants to up its stakes in existing and new foreign owned copper mines to 35 percent from between 10 and 20 percent so as to influence decisions, including protection of jobs during the downturn. The plan has put Zambia in the spotlight, with fears it could be reverting to the failed nationalisation of copper mines in the past, or aping neighbouring Zimbabwe, which has said 51 percent ownership of foreign firms must be locally held. The move appears to have come as a knee-jerk reaction to the December closure of Luanshya Copper Mines (LCM) units -- the Baluba copper mine and Chambishi Metals Plc -- the country's largest cobalt producer, which led to huge job losses. The closure unnerved Zambia's government, forcing it to react in the face of demands from unions to save jobs in the Copperbelt region where the government is already unpopular. "However, neither the government nor ZCCM has the budget or access to finance to make good on this plan," Eurasia group's analyst for Middle East and Africa, Philippe de Pontet said. "These comments may reflect political posturing and a bit of empty nationalism rather than a clear policy direction." London-listed Vedanta Resources Plc (VED.L: Quote), Canada's First Quantum Minerals (FM.TO: Quote), Equinox Minerals Ltd (EQN.TO: Quote)(EQN.AX: Quote) and Glencore International AG [GLEN.L] operate in Zambia. Officials at some of the companies said privately they were concerned by the plan to raise equity, and that it had caused uncertainty as they were unsure how it would work. Zambia's Mines Minister Maxwell Mwale said copper mines such as Luanshya were poorly run and inefficient and had shut down costing many jobs, and were blaming the global downturn. This was why the government wanted even more control. "We don't plan any nationalisation of the mines as they will still remain in private hands," Mwale said. "But all we want is to have a say in decision-making, after learning from what has happened in Luanshya." Zambia may be forced to re-think its latest move after scrapping in January a windfall tax on copper mines meant to take advantage of the commodities boom after mining firms protested and the metal's price slumped. The country expects economic growth to fall to 5.0 percent in 2009 from a forecast 5.8 percent expansion last year, due to the global slowdown, which has hit its copper output. Foreign exchange will shrink, but a big concern is the loss of up to 10,000 jobs and loss of earnings from copper exports, which pay for universities, schools, roads, hospitals, bridges in this poor nation of 12 million. Zambia's currency, the kwacha, has devalued by nearly 40 percent and the country plans to trim its budget and seek more aid from agencies such as the World Bank to weather the storm. Zambia nationalised its copper sector in the 1970s, but poor management and lack of fresh capital to develop the mines, led to a near-collapse of the sector before it was privatised again. It has since flourished. Treasury data shows foreign mine owners have pumped in more than $4 billion in expansions in the last seven years, while output has soared to 569,887 tonnes in 2008 from record lows of 200,000 tonnes in the early 2000s. Analysts said any move to upset the industry's momentum would see investors leave and output decline. "The government can't run the mines and this move could have a significant backlash. Donors may reduce their financing," University of Zambia professor of economics Oliver Saasa said. "The government might end up clouding out investors." Vice Presidents : The Executive Committee abolished the idea of Presidential bye-elections. They concluded that the Republican Vice President should be sworn in event of the President being unable to continue. The same committee had earlier concluded that it was not necessary to have a presidential running mate. So we have the prospect of an unelected Vice President becoming a President. This opens room for an in-house coup where the President could be "forced" to vacate office, with the next leader being legitimate provided that leader was the incumbent Vice President. It also reduces the incentive for presidential impeachment because the same party is guaranteed to hold the Presidency, regardless of the outcome. Potentially the resolution is a recipe for colossal mismanagement and national instability. Provincial Ministers - The Executive Committee proposed that provincial ministers should be part of cabinet, in line with Article 150 of the Mungomba Draft Constitution, which states that "there shall be a cabinet consisting of the President, Vice-President, Ministers and provincial ministers". At the moment the cabinet excludes provincial ministers. The idea appears to be that Executive Committee Chairman Michael Mabenga ( who also happens to be the MMD Chairman) argued that this move ensures "that provincial ministers have those powers to make important decisions for the benefit of people in their respective provinces”. As previously stated, my view remains that provincial ministers are pointless. They have no regional autonomy, they are unelected and above all they have no policy levers. As my friend pointed out to me recently they are only useful to the ruling party during campaign time. But there's a broader point here : the continued obsessions with the constitution defining ministries - it should be up to the President to define these ministries as conditions change subject to Parliamentary approval as recently suggested. Religion : The General Principles Committee rejected the Mung’omba Draft Constitution declaration that Zambia is a secular state (Article 8). The new preamble now reads “We, the people of Zambia in exercise of our constituent power; ACKNOWLEDGE: the supremacy of God Almighty; DECLARE the Republic a Christian nation while upholding the right of every person to enjoy that person’s freedom or religion; UPHOLD the human rights and fundamental freedoms of every person.” Regular readers will be fully aware that I support this declaration and my reasoning is set out at Draft Constitution Special - Part 1: State and Religion. Land Ownership : The Lands Committee adopted a close to bar non-Zambians from owning land. There are remains some confusion over whether this would apply retrospectively or not. This is one of those changes that will have little implication in practice but provides further incentives to foreigners for becoming full participating Zambians. In the article entitled ‘Global financial crisis and a call for the return to mixed economy’ Dr. Mbita Chitala calls for Zambia to go back to being a ‘developmental’ and ‘interventionist’ state, with nationalization, protection and isolation. To be fair, he did not use the word ‘isolation’, but his arguments against globalization, foreign direct investment (FDI) and international financial institutions amount to that. Let’s start by examining his main points. Like many others, Mbita Chitala blames the current recession on capitalist ‘greed and selfishness’. But these failings are not confined to business persons. They are also common among civil servants and politicians. It is better to avoid emotive words and to recognize that self-interest is common to all human beings, and, as Adam Smith understood when he spoke of the ‘invisible hand’, is normally a very positive influence. After all, the most effective way to improve our own economic position is to serve the needs of others. How did the ‘credit crunch’ come about? The problem originated from America’s Reinvestment Act of 1977, which was used by successive governments to gain popularity by putting pressure on banks to give high risk loans to homebuyers who did not meet the banks’ normal lending criteria. Congress was told that the government sponsored enterprises (GSEs) Freddie Mac and Fanny May would purchase the ‘subprime’ loans, and so rid them of non-market risks. These GSEs then ‘securitised’ the loans and sold huge quantities of these toxic packages on to the financial markets. This boosted house prices and encouraged more and more buying and risky lending, until eventually the bubble burst and caused widespread panic. The banks and the financial regulators were not blameless, but in essence the crisis was government created. The Economist warned about this housing bubble three years ago, but without effect. As for an article on 2nd February 2009, where the magazine “idolised Karl Marx and put him on their front cover page with the question, What would Marx think?”, Dr. Chitala is misinformed. There was no such article, picture or caption. It is still too early to judge how long the global crisis will last or what its results will be. The fiscal stimulus which the G20 countries, led by the US and EU, have embarked upon has won general support, but the dangers of inflation caused by creating funds from nowhere may have been seriously underestimated. Mbita Chitala’s warning that “the systemic crisis of capitalism is leading to a rapacious struggle for the earth’s resources” which could lead to “self-destructive apocalyptic wars” is wildly overblown. Wealth creation now depends less and less on physical resources. Human resources are vastly more important. Look around the world and you see that wealth depends primarily on education, institutions and entrepreneurship. Some of the world’s richest countries – for instance, Japan, Switzerland, Hong Kong, Singapore – have no physical resources at all. The great advantage of America, the capitalist HQ of the world, is undoubtedly its people. Mbita Chitala would like Zambia to return to its former ‘mixed economy’, with extensive nationalization and government controls. How much sense would that make? Enterprises owned and managed by governments are hardly ever efficient, and Zambia’s experience of them has been disastrous. Of the few that still remain – Nitrogen Chemicals, Times of Zambia, ZAMTEL, ZESCO – none is or was successful. Let our government put its own house in order and learn to operate efficiently, with civil servants becoming genuine servants of the people, rather than extend inefficient and often corrupt hands into running more businesses. Look around the world: wealth wherever it exists depends on free and competitive markets. Protection, which Mbita Chitala would bring back, means protection against the healthy influences of competition, trade and technology. Turning our back on globalization would be as sensible as declaring that the world is flat! How can Zambia come through the recession and reinforce the progress of recent years? By encouraging our local entrepreneurs and removing any unnecessary restrictions inhibiting their operation. By opening up fully to the beneficial influence of modern communications and international commerce, investment and ideas. By promoting education and knowledge of all kinds, especially in the fields of technology and business. By living within our means, restraining inflation and keeping taxes moderate. By opening up the rural areas and training our people in efficient farming methods. Disclaimer : The views expressed above reflects the author's personal opinions. They do not represent the views or policies of any organisation with which the author may be affiliated. Lusaka Gossip speculates on whether Dora Siliya's latest resignation marks a momentary shift in our politics. Foreign companies have invested about $710 million in Mozambique to produce 440 million litres of ethanol a year from sugar cane. About 48,000 hectares has been set aside for the production of sugarcane across six provinces. The production of ethanol will be led three companies : ProCana Ltd. a Mozambican company which has an investment agreement with Mozambique's government ethanol plant; Principle Energy, a renewables energy company in which London-listed fund manager Principle Capital has a significant undisclosed stake; and Groun Resoources. The projects could generate between 7,000 and 10,000 jobs. Read more here. The country's economy is battered. The fact has been laid bare. It is so naked for everyone to see! The mining sector, which is the country's lifeblood is in tatters, burnt by steep collapse in international copper prices. Levels of job losses in the country are frighteningly high. The statistics are vivid and some analysts are now hunkering down for more job cuts, not only in the mining sector but also in other sectors, as the periods of global recession look longer. In fact, some of the prominent towns on the Copperbelt like Kitwe and Mufulira may soon turn into ghost towns as Mopani Copper Mines (MCM) threatens to shut its mining units in the two towns. The worst case scenario might come from those companies that input directly in the general mining business. However, I am not about to start buttressing the already stated predicament, lest I am accused of being a prophet of doom. Truth is the situation is bad. "It is difficult to explain but it has happened. Me, I can take it but my wife and children can't just bear it," recently retrenched miner Joachim Ng'ambi poignantly said in a telephone interview from the Copperbelt mining town of Chingola. Ng'ambi is among the more than 12,000 former employees of the mining sector who have had their jobs unceremoniously cut as investors in the country's chief foreign exchange earner mull employment statistics in view of the copper prices which collapsed from the record high of about US $9, 800 per tonne on September 2, 2008 to the around US $2,900 by January this year. Other sectors too continue to follow the similar pattern. Doom and gloom seems to hinge the future of the country, a stark departure from hope and vitality that characterised the country a few months ago. The future to some extent looks bleak! This is exacerbated by the external environment which most indicators and economic analysts contend had now gone into recession and is not expected to be rescued anytime before June 2010 - at least if the current sick global economy responds well to Barack Obama's ambitious medication embedded in the close to US $1 trillion stimulus package. The World Bank last month released latest global economic projections for this year and this confirms everyone's fears. "We haven't seen a figure like that globally since World War II, which really means since the Great Depression," World Bank president Robert Zoellick said. "2009 is going to be a very dangerous year. It is indeed serious, and there are issues that go beyond the economic to political and social stability." These indeed are extraordinarily desperate times. "It can't be business as usual," Lusaka business consultant Bob Sichinga said in an interview. "We need to take drastic and unprecedented decisions to rescue our economy." While this is a very apt observation, has anyone bothered to ask how the retrenched miners and other people are surviving the aftermath of this catastrophe? "This is just so bad because I never planned for it [job losses]," laments Ng'ambi. "I just don't know whether to start a business or go back to the village, I just don't know my next move." This is the predicament that has befallen the once flourishing and admirable job sectors in the country. "The most important thing right now is to tell the people the truth. This global economic crunch is here for some time and that the people need to be told in order that they adjust their lives," observes respected Witwatersrand Professor of Journalism Nixon Karithi. No doubt this recession is going to reshape the country for generations to come, including the way people live and work. What will the future look like? Who will be the winners and losers? "People should be told reality so that they make adjustments to their livelihoods and prepare adequately for these hard times," Prof Karithi added. I just don't see that happening at the moment. It was incredible that while most countries and more resolute citizens of other crisis- hit countries are beginning to engage aggressively in initiatives aimed at making realistic response to the current challenges, I was perturbed the other day to see long queues of stranded women with babies strapped on the backs braving the cruel cold weather and jostling for best positions to get a place into the Mulungushi International Conference Centre for a fortune teller "to predict a bright future for them." Sadly, this was not an isolated incident. To any observer, both critical and casual, the country has seen an unprecedented upsurge in the number of functions and individuals conducting life coaching, motivational speaking sessions and name it, but all in all, giving the people hope beyond the crunch! It is obvious that anticipation and prediction based solution finders to the current economic crisis are raking a lot of money. My guess right; probably this is the only sector that has seen an upturn in this economic downturn. I have no doubt [Africans] Zambians have the greatest levels of faith on earth - sometimes, rather credulous than actual "faith." With due respect to life coaches, motivational speakers and prophets of prosperity, but I think the current problem cannot be solved through issuing rhetoric and sugar coated avowals that are not backed by reality. Not this period. What is critical at the moment is to inform people on how to adjust their livelihoods and navigate this economic tsunami. I remember not too long ago the outrage in the country when one of Zambia's most respected and celebrated finance minister Ng'andu Peter Magande deplored the increasing number of vehicles on the road which he said were burning gas "unnecessarily." "If you stand at Manda Hill robots at 07:00 in the morning, you are amazed at the number of vehicles going into town and these vehicles are only carrying one person when their capacity is average five, and some of these people are not even going to do anything productive in town," Magande said. "We surely need to find a more economic way of using fuel if we are to escape these high [fuel] prices." Of course Magande's comment came on the backdrop of the then skyrocketing government bill on importing fuel. The dynamics have no doubt changed but still remain very similar! Fuel prices have come down drastically lessening the pressure on the government importation bill but thanks to the current global economic psychosis, the expected gains have been reversed. "Magandenomics" is still valid today as it was last year when the minister proposed it. It is often said when a hurricane sweeps through a forest it knocks down a lot of the older, weaker trees. The younger ones survive and prosper. And so it may be in the economy. The micro level might just be the key. It is not ironic to suggest that when an economic crisis of the current magnitude strikes, the greatest and hottest heat is felt by the bottom billion [the majority] - the proletariats. This is not unique to the public sector as it is very palpable also in private sector. One just needs to compare the number of executive jobs that have been lost in the current recession with the ordinary jobs! Are our leaders both in private and public sector organisations doing enough to cushion the bottom majority from this economic tsunami? Sentiments coming from our leaders are that they don't expect workers to demand a "huge" pay rise this year because of "the current economic crisis." "I would like to commend president Hakainde Hichilema for urging the workers in the country not to demand for huge pay rise so that they help their employers to deal with this [economic] crunch," loquacious domestic politician and local government minister Benny Tetamashimba was recently quoted in the media commenting on similar calls by United Party for National Development (UPND) leader. Not that the calls are not ideal and welcome, but the question is: are the leaders ready to take similar positions? How interesting it would be if leaders and other constitution officer bearers could refund the people of Zambia on the hefty salaries they awarded themselves in the first 30 days of the current administration of President Rupiah Bwezani Banda! Executives at US giant insurance group, AIG have done it, albeit under public pressure but I guess not in this country. The moral dilemma for our leaders, both in public and private sector: Do they have the morality to demand from the bottom majority what they cannot give in return? As I discuss this survival plan, the question that keeps coming to the fore is how Zambia can insulate and protect the majority of the bottom poor and what messages are being communicated to them? The general questions are; does the country need to keep those hybrid and fuel inefficient vehicles, continue to eat out, spending on non-priority sectors, maintain children in elitist expensive schools, maintain more than one woman, move in tandem with technology by graduating from Iphone to Blackberry, dotcoms the list is infinity. I am not in any way denouncing such expenditures for those that can afford. I am looking at people who can no longer sustain such expenditures. Personal adjustments are not restricted to the bourgeois or the proliteriate but it is all-inclusive. Market analysts currently contend that even if the President Obama unprecedented economic stimulus package of close to a trillion dollars were to work miracles in the next few months, the benefits would take at least 12 to 18 months before they trickle down to countries like Zambia. "What Obama is doing is for Americans. You don't expect President [Obama] to start sorting out issues in other parts of the world before cleaning his own house," commerce minister Felix Mutati recently remarked. Essentially what that projection means is that we should not expect the local economy to turn around anytime before 2011. "A significant rebound in commodity prices is not likely before the second half of 2010," international metal analyst Fraser Phillips said in a research note last week. Citigroup has been warning that copper prices, which have gained over 36 per cent over the past two months, are soon likely to lose steam. "It is being dominated by a seasonal pattern and will likely be entering a weak phase of that pattern soon," Phillips stated. "We remain cautious." Amidst all these theories and projections for the economic challenges the world is going through which had not been seen since the great depression of post-first world war era, little is being said about how to survive this economic tsunami at micro level. Against that high level of uncertainty in the future of the global economic dynamics, I think it is crucial to start preaching radical adjustments to peoples' lifestyles. Whether or not stimulus spending in giant economies should ultimately lead to a strong rebound in the global economy, the trickle down effects in poor economies like ours would remain anaemic for sometime. Best still growth is unlikely and people should better be told that harsh reality so that they do not waste time queuing up and getting soaked trying to crash into the hall(s) to listen to some good preacher or some phony oral based solutions finder. It is not fair! Africa may not have been party to the ignition of this problem, which started with the governments of the West feeding their people beyond the means and reality, but the continent is engulfed in this problem. Tell the people the truth! Angola continues to push for infrastructure provision at all levels. The next stop is housing infrastructure - the Angolan government plans to launch a special fund in the first half of 2009 to help build one million new homes in four years for the poor and fight a housing crisis the president fears could lead to social unrest. An estimated two-thirds of Angolans live in shanty-towns surrounding the country's main cities without running water or electricity. A call for the return to UNIP policies? The causes of the current systemic crisis of capitalism and the way forward for countries such as ours are a matter of great debate and any meeting by citizens organized to discuss and seek solutions is always useful. I was not surprised to notice that many of the participants at the Indaba were yearning for change in the way we have been conducting our economic policies. In this recession where economic activity has slowed, there is a slowdown in our GDP growth rate, slowdown in investment, low capacity utilisation in our industries, and there are low real incomes of households and lower profits for companies, governments usually respond by adopting expansionary macro economic policies, such as increasing money supply (monetarists) increasing government spending (Keynesians), decreasing taxation (supply side economists) while laissez faire economists recommend that governments should not interfere with the so called market forces. What should be apparent in our country is the fact that the current international financial crisis points to the collapse of laissez faire economics and discredits market fundamentalism. This collapse of the Chicago School of Milton Friedman further implies the fact that Zambia, as is the case in many African countries, must break free from these failed neo-liberal policies and their institutions that have promoted them and define its own path of growth and development. The US sub prime mortgage crisis and the bursting of other real estate bubbles around the world were symptoms that helped create the global financial crisis. The real cause was however imbedded in the vagaries of the international capitalist system. The so called globalization simply refers to a phenomenon where the world is controlled by the financial oligarchy or what my good Egyptian friend Professor Samir Amin described as the “financiarised” groups – the oligopolies who do not produce profit, but rather, they just swipe the monopolies rent through financial investments. My other Ugandan friend Professor Dani Wadada Nabuere, in agreeing with Amin correctly argued that the core of the crisis is over-extension of credit on a narrow base resulting in a phenomenon where money has become detached from the material base of a money commodity that can measure its value such as gold or silver. What do these observations by these eminent African scholars mean in reality? To understand this, we must go back in history. After the Second World War, the expansion of the world economy was based on the United States Dollar which provided the link between money and the gold standard. This link collapsed in the 1970s under the reign of President Nixon and the US Dollar became the global currency, but without a backing to this currency from a money commodity like gold as was the case previously. Since the collapse of the gold standard, there has been unmatched expansion of global credit – growth of paper money and monetary instruments such as derivatives, future options and hedge funds at a faster rate while the productive base grew at a slower rate. Consequently, the “financial bubble” which the world has been experiencing lately became the logic of this imbalance. Samir Amin estimated that “the gross amount of financial instruments in 2008 amounted to two thousand trillion dollars while the world Gross Domestic Product (GDP) was forty four thousand trillion. This phenomenon was what precipitated the crisis. The growth of “speculative capital” has over-run the growth of “productive capital”. In other words, there are currently large amounts of credit circulating without the backing of any production at all. This “loose money” has completely run wild and is in a wild search to be given value. In other words, the owners of this “fake” money, those holding United States Treasury Bills and bonds, want to preserve their wealth and prevent themselves from financial collapse. Capitalism or more appropriately, this aging capitalism cannot re-invent itself. It is doomed by its greed to wither away. Its logic has resulted in or engendered global stagnation of production with its side effects of recession in the north and economic depressions in the south. The shrinking wages, the increasing levels of unemployment, the worsening of poverty and disease of many nations of the South – all this is symptomatic of aging capitalism gone senile. For the Northern countries, the only way their aging capitalism can stay afloat, is by these states nationalising many of their key banks and corporations which can no longer survive because of the shortage of liquid cash. The world is now witnessing a situation where these capitalist countries are being forced to move back in the direction of central planning and management of economies - a phenomenon they hated so much not long ago. Furthermore, this systemic crisis of capitalism is leading to a rapacious struggle for the earths resources. The 15 per cent of the planets population who currently consume 85 per cent of world resources want to continue with their opulent life styles at the expense of the rest. That is why the United States under President Bush wanted to continue with its global military control of the world by establishing Coricom on the African continent to secure the exclusive access to Africa’s resources against impediments that India and China may wish to introduce. Similar clouds of war as occurred in pre 1914 and 1938 are building up and the world should be preparing for self destructive acolyptic wars. The lesson for our country is that we must strive to free ourselves from the shackles of neo-liberal capitalism and explore new paths of development. In all religions of the world, countries are moving away from this discredited neo-liberal paradigm. Gordon Brown correctly characterised it as the collapse of the Washington Consensus. Of course, this change will require the political will of our leaders who must be willing and able to explore alternative development policies and programs. Our own Guy Scott prescription (The Post of 14 April,2009) that we must continue with the failed paradigms of the Washington Consensus is obviously a misreading of our history and a road to continued disaster. The G20 group of nations who met recently in London realised that the priority of all nations must no longer be inflation but jobs and economic recovery. The IMF and the World Bank who forced our countries to adopt Structural Adjustment Policies (SAP) have now changed their views and they are now supporting fiscal stimulus – that is, expansionary fiscal policies, rescue plans and nationalisation. These policies have since 1980s been denied to Zambia and all developing countries as these policies could impede the interests of global capitalism. We must challenge and reject all the failed SAP policies. This is the same conclusion arrived by the Prof. Joseph Stiglitz Commission appointed by the UN General Assembly. We must use both fiscal and monetary measures to mitigate the impact of this financial turmoil. We must restore capital controls and reverse liberalisation of the capital account which, since 1993 in Zambia, simply opened doors to speculative capital flows, tax evasion and capital flight and has contributed to lowering of Zambia’s domestic savings while increasing our dependence on foreign aid. We must do away with fiscal and monetary austerity as prescribed by the Breton Woods Institutions as this has been choking our economic expansion and limiting our public investment and social spending. We should learn from President Obama’s USA that stimulus policies in times of crisis are a historical necessity; while fiscal restraint has no economic logic. We must reject trade liberalization and restore protection of our domestic market. Trade liberalization has simply increased Zambia’s external dependence, destroyed our domestic industries, accelerated our de-industrialization and led to the deterioration of our terms of trade. Our ability to feed ourselves has been compromised by the foolish conditionality that we must invest in cash crops at the expense of food production. The forced privatization translated into massive job losses and social exclusion of our people. We must learn from what is happening in the USA, Latin America and Asia where governments are taking back what was sold off to foreign interests in order to restore their people’s sovereignty over their nations’ resources. President Ronald Reagan in the 1980s wrongfully stated that the state was a “part of the problem and not of the solution”. As a result of this policy prescription, there was massive de-regulation and assault on the state, public service and ownership. Zambia and many African countries were subjected to devastating Structural Adjustment Programs (SAPs). Our countries were characterized by the so called Washington Consensus, as being “predatory, wasteful, rent seeking, corrupt and inept”(Thandika Mkandawire 2001 o.p.cit). They tried to weaken our states and forced us into imposed fiscal austerity programs, downsizing of our public service, dismantling our public sector and privatizing all state enterprises. These were policies to nowhere. It is now apparent that a strong developmental state is an indispensable and indisputable agent of development. It is now clear in all observations of countries’ experiences, that deregulation and market fundamentalism are part of our problems. We must restore the role of a strong and active interventionist state. Since it is foolhardy to expect external sources of finance to develop our country, we must raise resources internally. This policy prospective is also the view of the AFDB who have recommended that our countries must boost domestic resource mobilization, increasing domestic savings. The ecumenical organization Christian Aid (2008) in their publication “Death and Taxes: the true toll of tax dodging”, noted that our country has been losing billions of tax revenue due to lack of enforcing agreements with foreign mining companies who have been resorting to various means to avoid paying taxes. Our country has a large enough tax base to fund our own development. Judicious use of our pension funds as well as prudent use of our annual budgets can meet all our developmental needs. The argument as advanced by some right wing scholars that we must attract Foreign Direct Investment (FDI) is not sustainable as none will come however much we try. How does Zambia get out of the mess? The conditions for a genuine positive answer to this question must be a return to the mixed economy where state capitalism co-exists with strong social democratic policies. We must return to democratic socialism (not totalitarian communism which is easy to vilify). The dream for democracy and socialism has been the dream of the pioneers of the MMD in their draft program which was substituted later by the doctrines of Milton Friedman and the Chicago school of economics – privatization, deregulation and cuts on government services. We must address our budget expenditure policy to reduce wastage by re-introducing Government Stores and eliminate unnecessary costs. It is unbelievable that a rim of paper that costs K18,000 in normal shops is bought by government departments at anywhere above K70,000. Tarring a kilometer of road which averaged $200,000 in the sub region is anywhere above $1 million in our country. We must restore our self-confidence and trust in our own people and aggressively accelerate regional and continental integration of Africa. We must institute a public works program to address the employment needs of the more than five million Zambians that are currently unemployed or underemployed and many who hover between suicide and madness. We must nationalize those mining companies that want to stop mining and place their mines on care and maintenance, as well as increase our stake in all the other mines which must be declared strategic to our nation. Our government must raise capital and invest in power generation and restructure ZESCO, re-introduce an agricultural marketing board, re-capitalize NCZ, re-establish an agricultural bank, empower our own middle class, and invest in the social sector. The truth is that we are our own makers of our history and foreign aid as we have known it so far tends to make us complacent and non creative. “Out of the way they [NCC] have directed themselves, there is nothing good to expect. What they came up with yesterday, bena Mabenga behaving like a star, is not helping us in any way. I don’t mind them getting allowances, it’s their entitlement but they should do a good job. But as things stand, they seem to be more obsessed with their pockets than the needs of Zambians. And they seem to have people they are fighting through a new constitution. This is very retrogressive..they are busy treating the Mung’omba recommendations like scrambled eggs. They are treating the Constitution as if it’s a personal document or an MMD document. I am aggrieved as a former commissioner and I wish there could be someone with moral principles in that NCC who could reverse the situation and uphold the people’s wishes." When traditions and rights collide? A new post at the House of Chiefs blog on Traditions Vs Human Rights? Mines and Minerals Development Minister Maxwell Mwale said it was unfortunate that Zambian small-scale miners were busy blaming the Government for not doing enough to help them when mineral rights had been availed to them. Mr Mwale was speaking in Kitwe on Wednesday when he visited Kagem Mining on his way to Solwezi. He said in an interview shortly after holding a meeting with Kagem and Gemifields chief executive officers Alok Sood and Ian Harebottle that the mere fact that the Government gave locals mineral rights was enough commitment on its part. Mr Mwale regretted that some Zambians were selling the mines instead of using the mineral rights as equity contribution to develop the mines. He said failure of the emerald industry was caused by Zambians who failed to properly utilise the mineral rights. “The Government saw the need to empower locals hence the decision to give them mineral rights but unfortunately they (Zambians) are the ones who started selling these mines to foreigners,” Mr Mwale said. The minister said in its efforts to further empower Zambians, the Government and the European Union (EU) came up with a credit facility scheme meant for small-scale miners to access funds for the development of the mines. Precious stones are still fetching attractive prices on the international market despite the global financial crisis. Therefore, medium and small-scale entrepreneurs should scale up production of precious stones for the country to earn the much-needed revenue. The Government on its part has offered incentives to medium and small-scale entrepreneurs in the mining sector for them to develop their mines in order to keep their operations afloat. Mines and Minerals Development Minister Maxwell Mwale has thus challenged medium and small-scale entrepreneurs to take advantage of incentives the Government has offered such as mineral rights whose process has been streamlined. It is evident that some emerald mines in Lufwanyama and other parts of the country are lying idle while owners have continued to grumble about Government assistance when incentives are already in place. Some people have sold off the mines instead of developing them. The Government has streamlined the process of acquiring prospecting and mining licences. Zambians should take advantage of the streamlined process and engage in profitable precious stone mining in Lufwanyama on the Copperbelt, parts of Eastern, Southern Provinces and Mumbwa in Central Province. The production of precious stones such as amethyst and emeralds could earn the country much needed revenue as it diversifies from mining copper whose prices have plummeted tremendously on the international market. The Government has time and again advised Zambians to engage in precious stone mining, which had not been exploited to the full despite its lucrative nature. In Lufwanyama for instance, many mines have remained idle after owners acquired licences, while a vast area has not been exploited despite the Government streamlining the process of acquiring both prospecting and mining licences. In the past, some people had complained that bureaucracy marred the process but even after the Government streamlined the issuance of mining licences, there has not been any improvement. In fact, there are reports that some Zambians are obtaining mining licences and giving them to foreigners to undertake operations at a fee. Such activities should be stopped immediately as they can retard development when the Government is in a hurry to empower the locals. We hope the Emeralds and Small-scale Miners Association of Zambia and other stakeholders in the sector will heed the minister’s advice and take advantage of the Government incentives. Fortunately, in his eagerness to maintain job security the Editor inadvertently made some interesting points, although he forgot the most important one : "Zambia has the world’s second largest emerald deposit after Colombia in South America and also boasts of Africa’s biggest amethyst and aquamarine fields but the proceeds do not reflect this status ", according to an earlier piece. That piece of information coupled with the editorial's inadvertent point that the price of gemstones has remained fairly sound during the global slowdown suggests that the issue is broader than simply enabling ordinary Zambians to have licences. The issue of licences is actually a misnomer, the larger problem is that this should be an industry that is properly regulated and possibly with a stronger element of state production. The logical conclusion becomes obvious once we recognise that Zambians current approach with licences is rational. Providing licences to Zambians will continue to lose government revenues because the incentives for ordinary Zambians to develop the mines is fairly weak. Simply put, its cheaper and more immediately rewarding for many Zambians to allow foreign production (by charging the "fee") rather than develop the mine themselves. To successfully develop these mines not only do you need credit, but also access to established supply chains. The foreign investor has all these things in abundance and crucially they are able to harness the economies of scale that are associated with pooling licences together. Bizarrely the more attractive gemstone becomes the more foreign investors push out the locals! Unfortunately for GRZ the foreign operators keep their cash abroad where they live! Zambians are lazy alright, but their laziness is the failure to speak up and get government to stop being perpetually incompetent! The Ministry of Home affairs has deployed more police officers in border areas to stop human trafficking. Home Affairs Minister, Kalombo Mwansa, says government is determined to address the problem of human trafficking and is doing everything possible to strengthen the fight against the vice. He says despite serious efforts by government cases of human trafficking are on the increase. Dr. Mwansa said in an interview with ZNBC news that his ministry has provided all necessary facilities in border areas to reduce cases of human trafficking. Dr. Mwansa also said he will soon be meeting with other SADC ministers to share ideas on how best to approach the problem of human trafficking. Another new entrant to the online newspaper business - the Lusaka Paper. By the way it appears the new blog Lusaka Gossip has found a new home. This announcement should come as no surprise. The entire country is full of minerals, the problem is that the geological maps have never been updated. In the meantime, what happened to the oil exploration? Apparently. According to Peter Cotta (Millers Association of Zambia) the total white maize output in 2008/2009 will exceed the 1.2 million tonnes produced last season owing good rains and plantings by farmers. Angola is after more loans from China after having received $1bn last month. In another development dos Santos has got rid off the Central Bank Governor. If you are still thirsty for more of the Professor you can see previous video clips here and also check out his website. A zombie approach to the crisis ? Oxfam on the "new mining fiscal regime"